We've had a handful of junky episodes in a row, but this episode was above-average. No winner, but there were some great parts, and I'd watch it again. When it began, I wasn't sure where the story was going, especially considering the title. Even the teaser clip made you think that Cartman might be the one falling for new girl, Nichole. 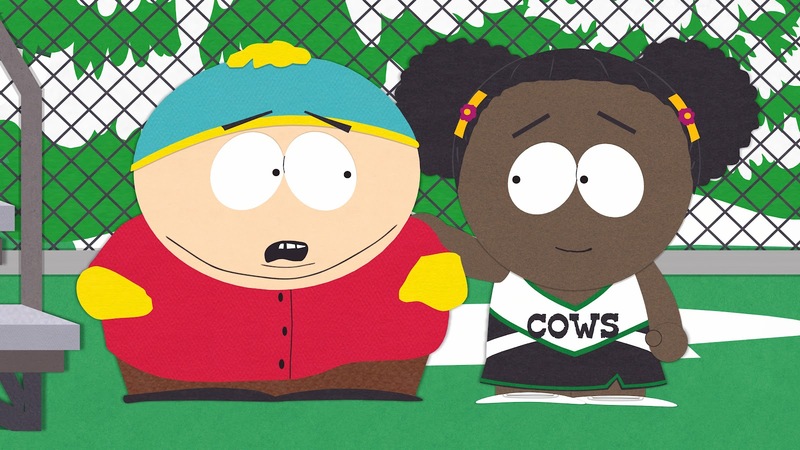 Well, it was actually Kyle... but Cartman's racist self was in love with the idea of pairing Token with Nichole, just as he apparently did with two Hispanic students earlier in the school year. Cartman's "CupidMe" and the fact that everyone was obsessed with the BatMobile were top-notch jokes throughout the episode, only getting better toward the end of the 22 minutes. Oh, and All-4-One's "I Swear" covered by Cartman? Great stuff! The only area where this was a little weak for me was the "Cartman and Kyle are gay" part... Kyle was pretty angry with Cartman for spreading the gay rumor, but he actually did very little to help set things back to normal. And, Cartman is rather intolerant of anyone non-mainstream, so why would he be willing to say that he's gay? Oh well, I guess we'll have to wait it out on that one!